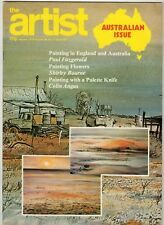 The Artist magazine in excellent condition. Has been kept in the loft for many years and is why the condition is so good. Travelling Hopefully 1: In Search of the Picturesque. The Royal West of England Academy. 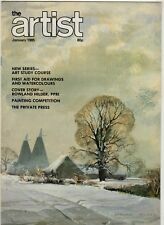 The Artist magazine in excellent condition. Has been kept in the loft for many years and is why the condition is so good. The Poet's Vision. Painting with Light 3. Artists' Gift Guide. Objective Painting 3. The Artist magazine in excellent condition. Has been kept in the loft for many years and is why the condition is so good. Horizontal Circles in Perspective. Signing Your Painting. Club News from Australia. 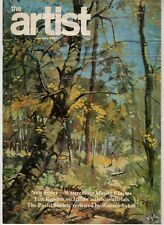 The Artist magazine in excellent condition. Has been kept in the loft for many years and is why the condition is so good. Bridging the Gap. The West Midlands. The Palette. 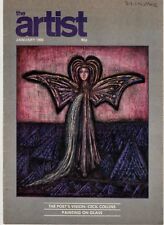 The Artist magazine in excellent condition. Has been kept in the loft for many years and is why the condition is so good. Shirley Martys Derbyshire Painter. Watercolour Master Class - Structure in Watercolour Painting. Inaugural Issue. Books (First Editions /Signed / etc). X4 copy's of 'The Artist' Magazine giving Instruction in all Branches of Art. Issues 139/140/143 & 144, for the Months of Sep, Oct, Jan & Feb 1942/43. Each magazine features a number of coloured plates, tutorials, a featured Artist. Issues 163 through to 168, for the Months of September - February 1944/45. X6 copy's of 'The Artist' Magazine giving Instruction in all Branches of Art. Each magazine features a number of coloured plates, tutorials, a featured Artist. Issues 151 through to 156, for the Months of Sep - Feb 1943/44. X6 copy's of 'The Artist' Magazine giving Instruction in all Branches of Art. Each magazine features a number of coloured plates, tutorials, a featured Artist. Issues 133 through to 138, for the Months of March - August 1942. X6 copy's of 'The Artist' Magazine giving Instruction in all Branches of Art. Each magazine features a number of coloured plates, tutorials, a featured Artist. Issues 157 through to 162, for the Months of March - August 1944. X6 copy's of 'The Artist' Magazine giving Instruction in all Branches of Art. Each magazine features a number of coloured plates, tutorials, a featured Artist. Tattoo Expo Magazine Vol.1 No.17 1995 MBox2928/A Inkslingers Ball Exclusive 1995 Convention Coverage. Once we have received your request we will then send you a unique authorisation code. AESCULAPE # 1 JANUARY 1932. Nom de publication Aesculape. EDITION North African and colonial. Date de publication 1932. THE letters and the ARTS. A few tasks and FOLDS. INSIDE OF THE REVIEW PRESENT. 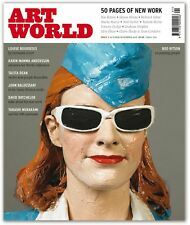 This is an as-new, perfect condition copy of Issue 1 of Art World, a glossy contemporary art magazine, which ran from 2007 to 2009. The cover features an artwork by Boo Ritson, who discusses her groundbreaking “painted people” inside. (International edition. /glass/cupboard). Kindest regards. Jonathan Glancey (Editor). Author: Jonathan Glancey (Editor). Size: 310mm Tall, Folio. Size: 310mm Tall, Folio. Binding: Softcover. Official magazine of the International Academy of Architecture. Publisher: Grosvenor Press International, 1989. Varoom Magazine, Rare Launch Issue No.1 2006. Graphic Design Journal Art Images. Condition is New. Dispatched with Royal Mail Signed For® 1st Class Large Letter. My ref 060/Gr/contop. • The proposals for the Shard of Glass. • Stirling's No 1 Poultry - 1994. • City Lit Building in Covent Garden - Allies and Morrison. What does British Architecture stand for?. • The Arches centre, Belfast. 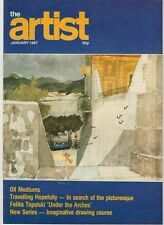 The Artist is Britain’s longest-established practical art magazine, first published in 1931. A chance for you to own this genuine international designers network shaping there own patterns magazine in excellent condition. International edition. there are no apparent marks on surface. this has never been used but has been in storage for a while. A chance for you to own this genuine international designers network interactive designe issue magazine in excellent condition. there are no apparent marks on surface. International edition.